How do I register for the 2019 Port to Fort 6K? Where can I download the Port to Fort flyer and/or poster? How do I create or form a team? The choice to join or create a team is available during the registration process. While registering at Port2Fort.org, a step of the registration process will ask if you want to form or join a team. At that point you can create a team and others will be able to join it when they register. How do I edit my account/fundraising page/team name? When you registered for the event, you created an account through FirstGiving, the system that we use to administer the Port to Fort event. Use the account information you created to log into FirstGiving.com, where you can make changes to all of the information that you originally submitted, including Team Name, age, contact information, etc. Are pets allowed in the Port to Fort 6K? Unfortunately, pets are not allowed in the Port to Fort 6K. Are child strollers allowed in the Port to Fort 6K? Yes, strollers are allowed in the race. Please do be considerate and join closer to the end of the starting line. Do I need to register children who will accompany me in a stroller? No, only children who run or walk on their own need to register for the Port to Fort 6K. How do I get to Coke Field? Take exit 55, follow signs for Key Hwy/Ft McHenry N.M. and merge onto E McComas St. Turn right onto Fort Ave.
Coke Field is at the corner of Fort Ave. and Woodall St.
Click here for google maps to the field. Take exit 55 follow signs for Key Hwy/Ft McHenry N.M. and merge onto E McComas St.
What time will the neighborhood streets be shut down? Yes, free parking is available. See the runner handbook for more details and map locations. 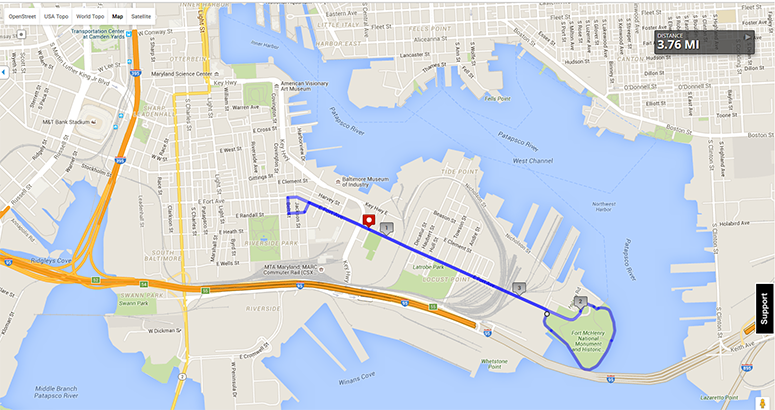 The race begins on East Fort avenue directly in front of the Locust Point Fire Station (1001 E Fort Ave, Baltimore, MD). The race ends on Whetstone Way in between the side of the Fire Station and Coke Field.